Read any blog post about retail digital signage, and it will likely revolve around customer-facing engagement. But it won’t touch on the importance of internal retail communication. These blogs will boast about interactive integrations or dynamic campaigns, where the customers are always the end users. While these blogs are informative, they miss the point. We asked our CEO to sit down and share some insight into what digital communications can do for retailers. The biggest mistake digital signage users make in retail is only using their deployment on the consumers. Retailers should take advantage of the medium’s ability to connect managers and employees through internal communication. Digital signage goes beyond advertising and focuses on the foundation of the business. It communicates the information that drives critical business decisions. Retailers are competing against the at-home shopping wave. Consumers can curl up on the couch with their coffee and blankets and surf shopping sites. Brick and mortar shops need to offer an experience that outshines the Amazons and ebays. When a consumer enters a store, their mindset is already more inclined to buy, so they can walk out with a product. So, it’s essential that employees interact positively with these consumers upon entrance. Employees with low enthusiasm for their jobs are not going to engage with the consumer. Because of this, the brand appears abrasive and depressing. The customer walks away with an uncomfortable experience. Companies remedy this issue by reassessing their internal communications and focused on engaging employees. What better way to accomplish this than through their digital signage? 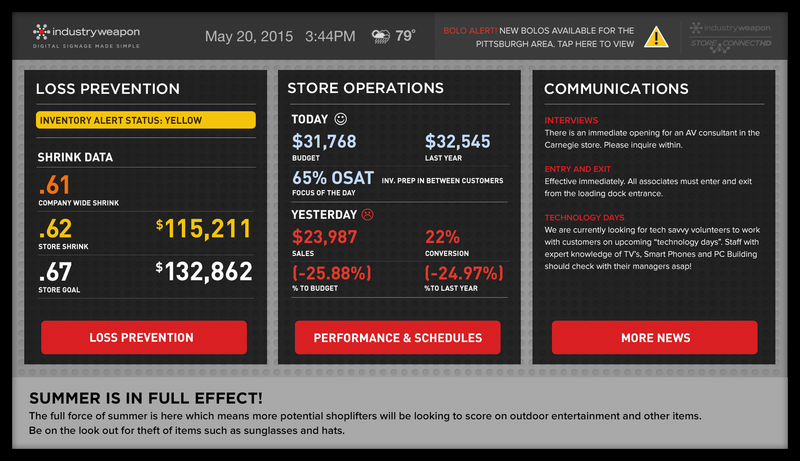 Employees see production stats in real-time with digital signage solutions. Digital signage software capabilities stretch much farther than just displaying marketing messages. Industry Weapon's StoreConnectHD aims to drive the crowded and overwhelming walls of the back-room bulletin board into extinction. The technology allows retailers at the corporate, regional, and store level to communicate with associates through touch screens and tablets. Using one interface, retailers access loss-prevention statistics, sales-performance metrics, employee schedules, distribute video and display shrink data with category-specific missing-product details. Retailers can also use Industry Weapon's platform to streamline two-way communication between regional managers and associates. This is included alongside POS systems to automate promotional items and HR messaging, like employee manuals and training videos. "What retailers end up seeing is less time being spent organizing, finding, and distributing information and more time focusing on the consumer experience," says Industry Weapon’s Director of Sales, Ryan Barlow. A motivated employee who feels connected to the brand is more inclined to engage with customers. They'll offer an experience consumers can’t receive from their computer at home. Build a strong foundation for the business by starting from the inside, and the success will trickle down to the consumer. Sure, consumers are likely to partake in interactive social media integrations. But their next focus is the brand’s personal representative- the customer-facing employees. These sale gatekeepers should be the main audience of the brand’s internal signage. In the retail world, it’s an age-old dilemma: should managers and employees manage internal work assignments and ignore customers, or tend to customers and neglect the backroom duties. Sure, communication efforts and task management in retail corporations are extremely important to the overall success of the business, but without devoting time and attention to customers, the business is doomed. To remedy this situation, many HR departments have implemented Workforce Management (WFM) systems into their companies. WFM promotes manual process efficiency, effectively gathers and retains data, and builds time for engagement among managers, employees, and customers. WFM encompasses all of the popular areas of management like payroll, scheduling, compliance, fatigue management, absence management, performance management, HR administration, budgeting, talent acquisition, training management, and emergency assistance. While WFM solutions have the ‘set it and forget it’ mentality, the communication efforts only reach the employees who are able to check a computer throughout the day. Most retail employees are rarely behind the computer unless it’s for Point of Sale (POS) purposes. Digital signage is quickly becoming the industry standard in retail. It allows internal signs to display real-time updates on all aspects of WFM. These signs are the fastest way to connect with employees who are not able to check their email for company announcements while on the clock. Signs located in the backroom, or facing out of customer sight, can display all of the information WFM solutions can provide. Managers can see who is on the floor or who is running late, at a glance. Employees can see hours, access the employee directory, and view their pay statement. Mobile capabilities allow managers to make transaction approvals even when they’re not on site. Integrations and applications are the easiest way to communicate company data to specific audiences, like store employees or upper management. Automated from existing data sources, integrations create informative, strategic, and aesthetic content. ‘Automated’ means once companies have supplied the digital signage software with a data source, the integrations will update each time management does. And the best part is company data is securely locked down and kept safe on the company's own network. Key Performance Indicators (KPIs) for sales per employees, financial goals, store performance, turnover, customer satisfaction, and labor expense are displayed instantly. Companies that use Salesforce to manage CRM activities can share pipeline reporting, goals hit or missed, team leader boards, and retention reports can integrate as well. With digital signage integrating with WFM solutions, retail employees can now and devote that attention to the deserving customers, knowing that they will not miss out on any important information from the company. Customers will no longer feel like they are being ignored by associates, or that they are stalking employees when simply asking a question. Turnover rates will decrease as both consumer and retailer reopen communication pathways.